Some good friends at www.straightbourbon.com – the world’s best bourbon site – have said nice things about this blog. I want to return the favour by putting up a bourbon whiskey review unadorned: no beer, no food history, no ten dollar words. The bottles pictured were bought on my recent trip to New York (Manhattan). Bought in New York, yes, but it’s all genuine Kentucky Bourbon. They are all in the “price” category, inexpensive. Having been involved in the bourbon renaissance since, well, forever, and with straightbourbon.com since 2002, I recall times when fine bourbon and U.S. straight rye went for a song. Yes, we had it good. But times change. Due to the buzz caused in part by groundbreaking forums like straightbourbon.com, bourbon, particularly aged bourbon, became more scarce in the market. Today, one can pay double or more to what was asked 8-10 years ago for the same bottle… It’s the price of success. In fact, even if one ignores the price difference, many brands still on the market from then (some were withdrawn) aren’t the values they were since the whiskey is not as old as it was. The glut then – from barrelled bourbon sitting long in warehouses when it wasn’t a fashionable drink – has disappeared, in other words. I tend therefore today to look for values, and some can still be found. One reliable brand, Four Roses Yellow Label, goes for $27 (CAN) or so at LCBO and is an excellent product: soft and reminding of certain yellow fruits. 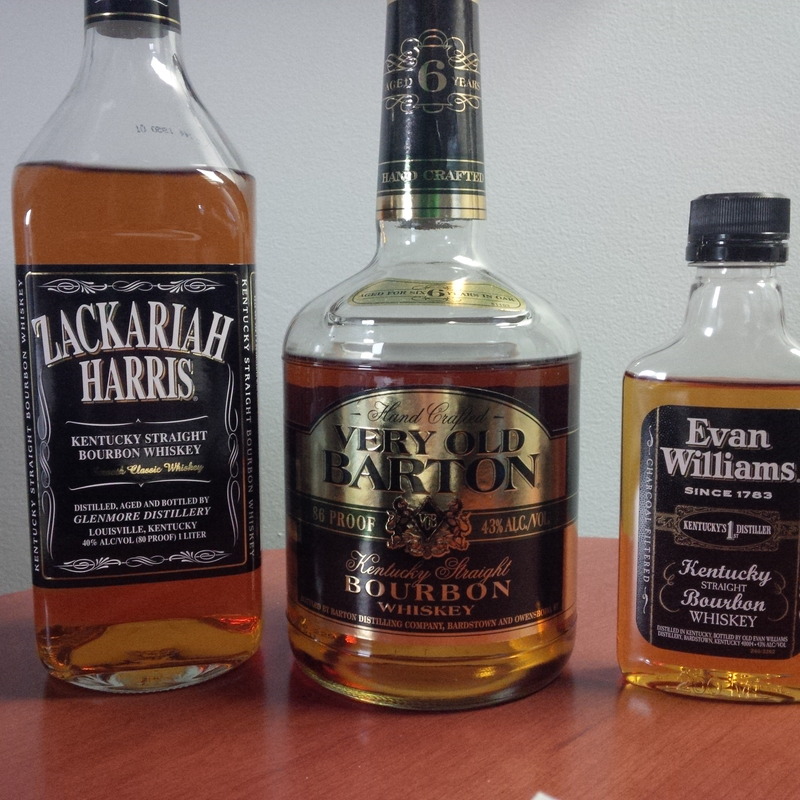 Of those pictured, Very Old Barton at six years old expresses the vigorous palate of the true whiskey taste of Bardstown, KY. It’s got lotsa wood and lotsa taste, it’s not that refined but it ain’t chemical moonshine either, not by a long shot. It mixes well, especially with Coke, but goes down on the rocks or with a splash just fine. The Zackariah Harris bottle is a litre of good times for only $15 (U.S.), and that’s midtown prices in N.Y.C., it’s even less in the regions. This is what the straightbourbon crowd call a NDP brand – non-distilling producer. A merchant bought the whiskey in bulk from an established distiller, put a cool name on it and put it on the market. Many of these are variable in quality but Zackariah Harris is a winner. Although it is, according to the neck label, only 36 months old, this is mature, very palatable bourbon. (Sometimes the whiskey in the bottle, or part of it, is older than the claimed age). It’s excellent sipped straight with a soft feel on the tongue and no off tastes of cleanser, soap or raw corn as you sometimes get in young whiskey. The Evan Williams bourbon is a classic from famed Heaven Hill distillery, also of Bardstown KY (spiritual centre of distilling in old Kentucky). It’s got a strong, clean taste with a little caramel, and while not as old as it once was, has plenty of old-time whiskey character. And it is under $20 a bottle for the regular 750 ml size. All bourbon is good except the young corny or chemical stuff. I will hardly knock the great bourbons aged from 8-21 years, I’ve had almost all of them in my time. They offer charming experiences peculiar to the distillery which made them or NDP who sold them. And your Knob Creek from old Jim Beam of Clermont, KY, at 9 years old (or it was last time I looked) is very sound by any measure. But good American whiskey doesn’t have to cost an arm and a leg. When I took that first sip of the Zackariah, it immediately brought back those first visits to lovely Bardstown, before the days of the celebrity distiller and master bartender. Before the time when the names of great whiskey writers were on the tongue of hipsters haunting the aisles of liquor stores. It was just the taste of the country south of the Mason-Dixon: a little smoky, sweet/maple-like, reminding one of good times talking with feet up on country porches and a wood fire going near by. I am not drinking any now, but I’ll make an imagined toast to the good friends I made in Bardstown, KY all those years: to Jim Butler, Bettye-Jo, Cliff, Jeff, Thad, Paul, Joe, Scott, Cam from Australia (yes), the late Tim Sousley, John Lipman, Randy, and many, many more. They are more important than the whiskey ever was. Great write up Gary, your blog has become a must stop for me. Thanks Squire, and please consider your name included in the list at the end, plus Doug Philips’, Wade’s, of course Chuck’s, etc., the list there was just illustrative.